Come see the original She’s Folks show! Join Betsy and the Boys at Hey Nonny! for a one-night-only She’s Folks Holiday Hootenanny. We’ve got new tunes, new stories, old favorites and all the boot-scootin’ holiday cheer! Everybody has to live somewhere. A creative and communal response to the global refugee crisis, Fixed Abode is an evening of stories, songs, comedy, art and poetry exploring the themes of displacement, long journeys, new beginnings, and the universal longing for a place to call home. Proceeds benefit GirlForward, an organization that creates opportunity for refugee girls in Chicago. Hosted by She's Folks own, Tyler Thompson, Fixed Abode III features the usual suspects along with some fresh faces: Praytell, The Lovettes, She's Folks, Wild Earp, Hillary Marren, Jacob Mau, Daniel Fager, Quentin Rynbrandt, a silent art auction, raffle for premium Hamilton tickets, and more! Tickets $30, open bar. Doors open at 7:30pm, show at 8:00pm. There will be pie. The Folks are hitchin' up the sleigh to bring you their signature Story, Song and Sass - with a seasonal twist. Join Betsy and the Boys as they celebrate the holidays with charming tales, Yuletide classics such as "Sleigh Ride," country gems like "Christmas Time is a-Comin'," haunting folk melodies including "Bright Morning Stars," and a medley of holiday hymns, as well as original tunes like "I-90 Take Me Home, " and "The Threshold" that are sure to become folk favorites. 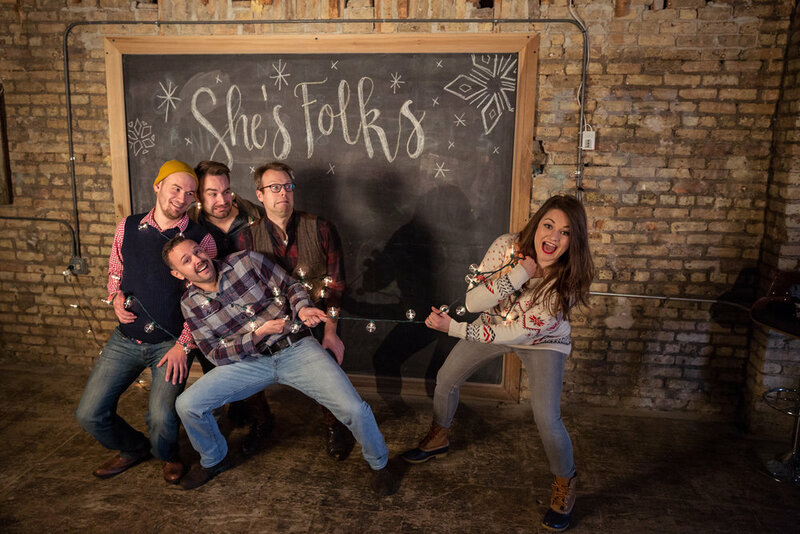 After wrapping up their summer with sold-out performances at Steppenwolf’s LookOut Theatre, She’s Folks is gearing up for the holidays with She’s Folks’ Holiday Hootenanny! Elizabeth Morgan and her band are hitchin’ up the sleigh to bring you their signature story, song, and sass–with a seasonal twist. She’s Folks has big laughs, tight harmonies, and one hell of a story about a goat. Join us for a hilarious and heartwarming holiday hoot! Steppenwolf’s LookOut presents She’s Folks!